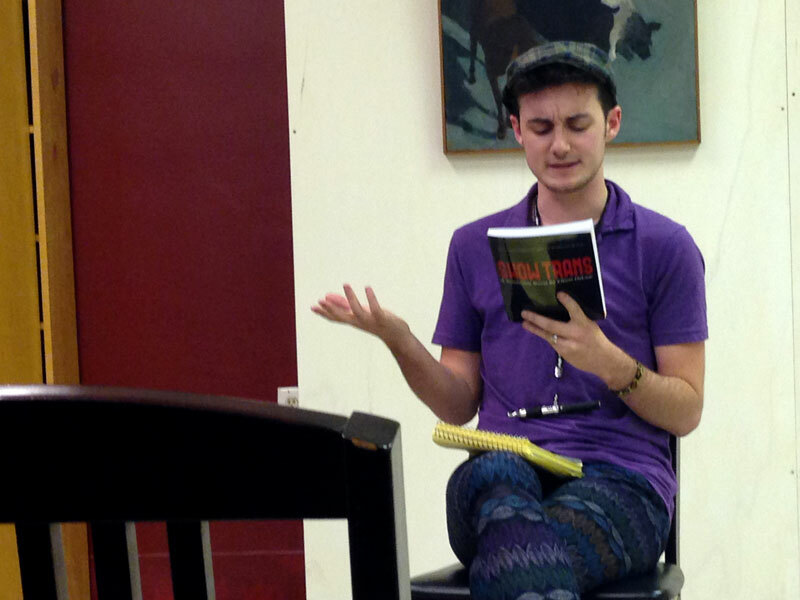 Author Elliott DeLine reads from his new boot, Show Trans, Oct. 15 at Buffalo Street Books in downtown Ithaca. Syracuse-based author Elliott DeLine read excerpts from Show Trans on Oct. 15 at Buffalo Street Books in downtown Ithaca. The novel chronicles a difficult period of DeLine’s journey with sexuality when he transitioned from female to male nearly five years ago. Show Trans, DeLine’s latest book, will be available on Amazon for Kindle download on Oct. 31. A paperback copy of the book, which the author self-published, was released Oct. 1. In the book, he addresses the difficulty of being a transperson in Central New York, including limited access to hormones and adequate health care, and said he wants other transgender people to feel a part of a larger community. “I want them to take away whatever they personally need to take away from it. I hope it makes other people going through similar experiences feel less alone,” DeLine said. A 2011 UCLA study says that approximately 700,000 Americans identify as transgender. No current governmental statistics exist because the U.S. Census Bureau does not offer citizens the option to identify as transgender on the decennial survey. Maureen Kelly, vice president for programming and communications at Planned Parenthood of the Southern Finger Lakes said research in 2009 revealed a definitive absence of care and resources available to transgender people. In 2009, Kelly founded Out for Health, a program that provides outreach to LGBT people, their health care providers and the community at large. The program commissioned research to understand the challenges LGBT individuals face in the Ithaca area. DeLine echoed Out for Health’s commission results. On Oct. 20, The Advocate, a gay news, LGBT rights, politics and entertainment magazine, published an opinion editorial by Kelly commending Ithaca, New York, as a “haven” for transgender people. Kelly noted in her editorial that the transgender preventative care and hormone program opened in winter 2013, offering healthcare, information, hormones and support for transpeople in the area. Additionally, Out for Health currently provides medical appointments, family planning, STD information and youth groups to citizens of Ithaca, Elmira, Corning, Hornell and Watkins Glen. Although there has been an increase in support services, Jason Hungerford, a board member of the Ithaca LGBT Task Force, said the area still lacks a definitive health care for the trans community. The task force was founded in the 1980s to advocate on behalf of the LGBT community for non-discrimination laws in Tompkins County and the City of Ithaca. In October 2013, the task force moved to an inactive status, responding to other programs that had begun serving the community. However, Hungerford also noted the fairness and inclusion gays and lesbians have benefited from still has not fully reached the trans community.